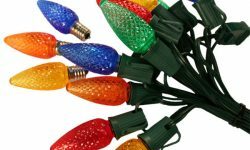 When it comes to C7 and C9 LED Christmas lights, you have a choice of either using a pre-molded stringer set which have bulbs that are already attached to the cord, or you can go with what is referred to as empty socket light line and add your own bulbs. 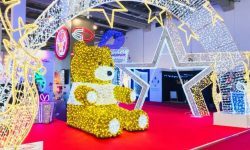 Most professionals and experienced Christmas enthusiasts prefer the empty socket cord due to the customization of the light line and the flexibility it offers during installation. At first glance, using empty socket C7 and C9 light line can be a bit intimidating. But the fact is that it is very easy to install and while it does cost a little more than the stringer sets, the finished product will look significantly better. 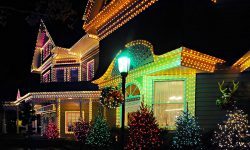 By following a few easy steps, even someone that has had no experience with Christmas lighting installations can install professional looking light line. Whether you are installing the light line around the perimeter of a building or using it with yard stakes to outline landscape features, the basic steps are still the same. Empty socket light line comes in 1,000' bulk cord spools or it can also be purchased by the foot. The cord is available in either C7 or C9 socket sizes with white or green cord. 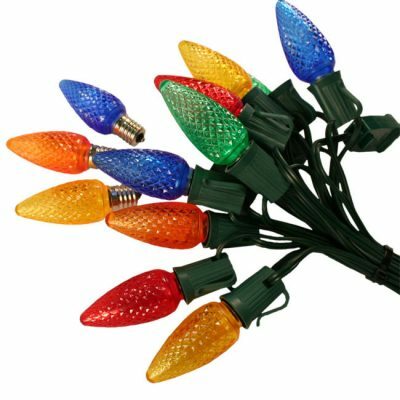 Spacing between bulbs ranges from 6" up to 36". For building perimeter applications, 12" spacing is the most popular choice, but on smaller structures, 6" or 9" is also sometimes used. For ground stake lighting, 15" is generally recommended, especially for longer runs. Due to the fact that light line sockets are the same for both LED and incandescent bulbs, you can go with either option. While LED bulbs have exploded in popularity in the last few years, incandescent bulbs still remain popular for perimeter lighting applications. If choosing LED bulbs, go with a good quality bulb. It's best to find a seller that also has an active installation department that uses the same bulbs that they sell. 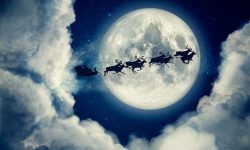 Here at Christmas Designers we install tens of thousands of LED bulbs a year and only offer bulbs that will hold up well for our installation department. There are a lot of inferior bulbs on the market and generally you won't discover the bulbs are poorly made until after you've put a lot of hard work into installing the light line. When it comes to replacement LED bulbs, also called retro fit LED bulbs, you have a choice between dimmable and non dimmable. If you are not planning on connecting your light line up to an animated controller, then go with the non dimmable version. These cost a little less per bulb and actually have about 10% more illumination than dimmable bulbs. Adding plugs to the cord is where most people balk at using empty socket light line. Our customers often think that this gets into dealing with electrical and they are afraid that it requires some special knowledge and is beyond their ability. In fact, the opposite is true. Adding a plug to C7 or C9 cord is extremely easy and can be done without having to deal with hard wiring. You simply put the cord in the channel on the plug and slide on the back plate and you're done. You'll need a male plug on the end where you plug the cord in and a female on the other end. The type of clip you choose will depend on the attachment surface. There are a wide variety of clips available, but be sure to buy the better quality versions available from quality Christmas sellers. Many retail store clips will easy break and won't hold up as well as clips that are designed for pro and commercial installers. LED C7 or C9 Retro Fit Bulbs - 400 bulbs or 400 feet, whichever comes first. 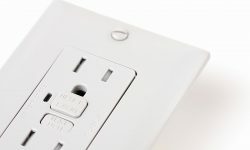 Once you've made the switch to empty socket cord, you'll wonder why it took you so long to find out about the benefits of this type of lighting. 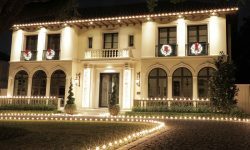 You'll quickly see why professional Christmas installers only use this type of lighting for their perimeter lighting projects. It's not only easy to install and customize the cord, but it also looks great. While the overall cost is a little more than using stringer sets, the improved aesthetics and overall ease of installation makes it well worth the extra initial investment.